A trademark dispute landed the gypsy brewer on Bryan O’Neal’s doorstep. The gypsy brewer in question was Jeppe Jarnit-Bjergsø, the founder of Evil Twin Brewing and perhaps the world’s most famous traveling brewer. 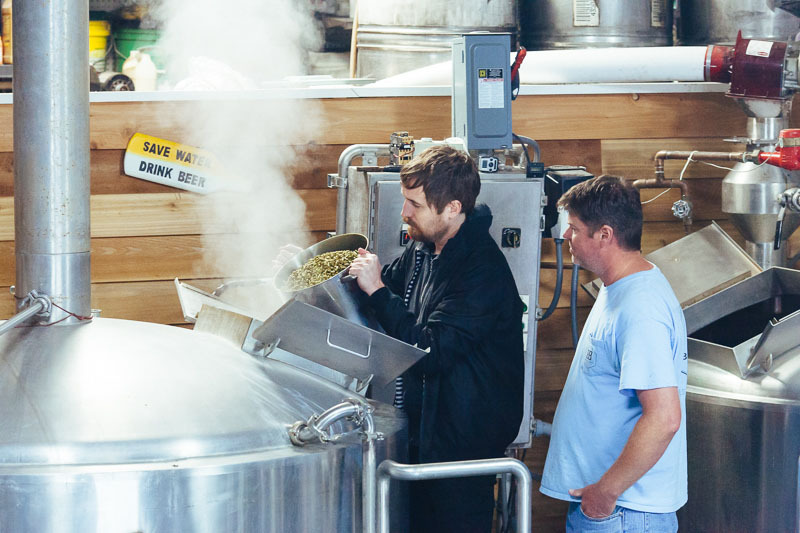 Jarnit-Bjergsø is accustomed to jet-setting all over the globe, stopping at breweries in places like Brazil or Italy only long enough to brew a beer and experience a bit of the culture before he’s on to the next one. Though he has no physical brewery to call his own, many of his beers come out of Westbrook Brewing Co. in Mount Pleasant, near Charleston, South Carolina. And he probably would never have had occasion to turn inland to visit Lancaster—a small, rural town about three hours away, near the state’s border with North Carolina—had he not trademarked the same name as O’Neal, the founder of Benford Brewing Co.
To understand the events leading up to their meeting, you have to go back to February of 2013, when the University of Illinois at Chicago published a study that found some participants were more creative and more apt to solve problems with a blood alcohol content of 0.075 percent. This wasn’t an unfamiliar concept to employees at CP+B Copenhagen, a creative agency in Denmark. Some of their best ideas were gleaned not during brainstorming sessions or in-house meetings, but while enjoying beers at the bar. In the summer of 2013, the agency pitched a 19-slide presentation to Jarnit-Bjergsø—who also hails from Denmark—with the idea of brewing a beer designed to help those who drink it reach their creative peak. After several additional meetings, the two parties started to discuss names and labels—and this is where everything fell apart. Many different names were volleyed back and forth, but no one could come to an agreement. Jarnit-Bjergsø’s wife, Maria, emailed CP+B a list of possible names for the beer, with The Problem Solver as the first choice. Jeppe Jarnit-Bjergsø maintains this was the first mention of the name, but CP+B says it was actually among 10-20 the agency sent him. And each side cites specific emails it says prove it was the first to come up with the name. Yet regardless of who came up with it, ultimately the name was just one area of many that the two parties couldn’t agree on. The plans to brew a beer together quickly fell apart. A year later, Jarnit-Bjergsø came across an article that said Copenhagen’s Rocket Brewing Co. had partnered with CP+B to brew a beer that promised to be “a delicious way to reach your creative peak.” It even featured an indicator on the back that told drinkers how much they needed to drink to reach the appropriate level of intoxication. And its name? The Problem Solver. Jarnit-Bjergsø was livid, and he only grew angrier as the beer began to gather international press. Jarnit-Bjergsø was once again caught off guard, however, when he found that someone had beaten him to it. That someone was Bryan O’Neal. Like Jarnit-Bjergsø, he too had seen the articles about The Problem Solver beer making the rounds online. But while Jarnit-Bjergsø discovered the article on his own, O’Neal didn’t know about it until his friend sent him the article on Facebook. He did this because the beer’s name was very similar to Benford’s World’s Problem Solver IPA. It was an easy comparison to make. As news about The Problem Solver spread, people searched for it only to find Benford’s beer instead. O’Neal received several emails and phone calls from people all over the United States looking to purchase it. “I trademarked the term that night,” says O’Neal, who named his beer not after a scientific study, but after his friend Buddy Barrier. The two spent many nights “solving the world’s problems” in a hot tub that O’Neal built. Buddy died in 2008 after a fight with cancer, but he lives on through the label of Benford Brewing’s IPA. Weeks after he filed the trademark, O’Neal received another call. It wasn’t from someone interested in buying the beer; it was from Jarnit-Bjergsø, who wanted to learn more about why O’Neal had trademarked the beer. After the two talked about the name and their own reasons for trademarking it, they agreed to get together to brew their own version of The Problem Solver. So it was that Jarnit-Bjergsø, fresh off trips to Switzerland and Italy, showed up at O’Neal’s doorstep in April. He spent the night with O’Neal and his family, and the next morning they went to the brewery to get started. The commute was a little shorter than those the globetrotting Jarnit-Bjergsø was accustomed to. They left the house and walked into a big, blue building in O’Neal’s backyard. Once upon a time, that building housed materials and equipment that O’Neal used to build high-end, custom pools for NASCAR drivers and Carolina Panthers players. Now it houses a 30-barrel brew house and stainless steel fermenters. Those fermenters are quietly bubbling away with The Problem Solver, a big 11.5% double IPA brewed with Simcoe and Amarillo hops. Bottles will be released this week across North and South Carolina, with the potential to see expanded distribution later. 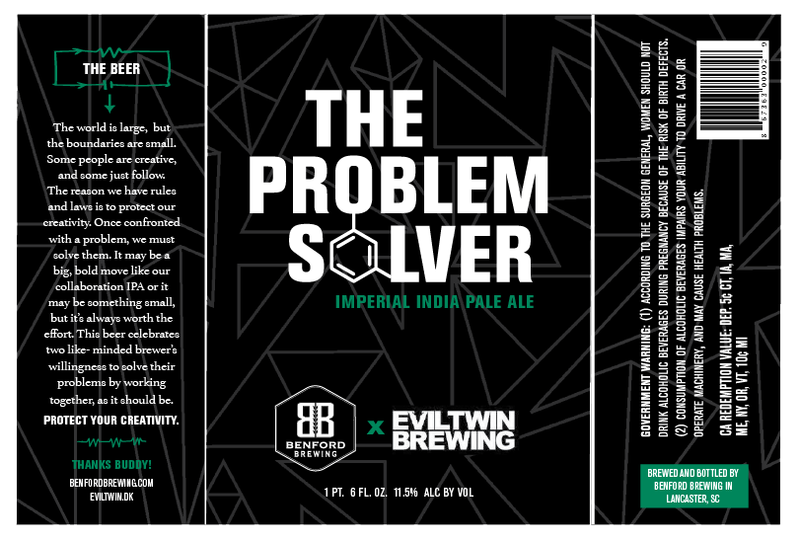 The label for The Problem Solver from Benford Brewing Co. and Evil Twin Brewing. That 30-barrel system is a good-sized one for a young brewery, but Benford Brewing’s original system was much smaller. After homebrewing for years, O’Neal decided to go pro. He fabricated his own nanobrewery out of 55-gallon drums and also built his own 110-gallon conical fermenters, which he would wheel in and out of small fermentation chambers. From that small system to his current one, he’s found that building a brewery isn’t all that different from building swimming pools. Both require a keen knowledge of how to use pumps, pressure and a little ingenuity to move liquid. As someone who assembled the brewery with no prior experience—from the gas, to the pumps, to the building’s very electricity—O’Neal is something of a problem solver himself. Behind the building is a big freezer that O’Neal got from an old McDonald’s, its stickers still plastered on the inside. And past this is the fence separating the building from the rolling fields behind it, where O’Neal’s cows graze languidly on the grass beneath their feet. They move a little quicker when O’Neal wheels out the forklift to dump spent grain over the fence, as he did between hop additions with Jarnit-Bjergsø. When a pecan tree fell on his property, O’Neal used its wood to smoke the malt in his Smoked O’Hickory Brown Ale. 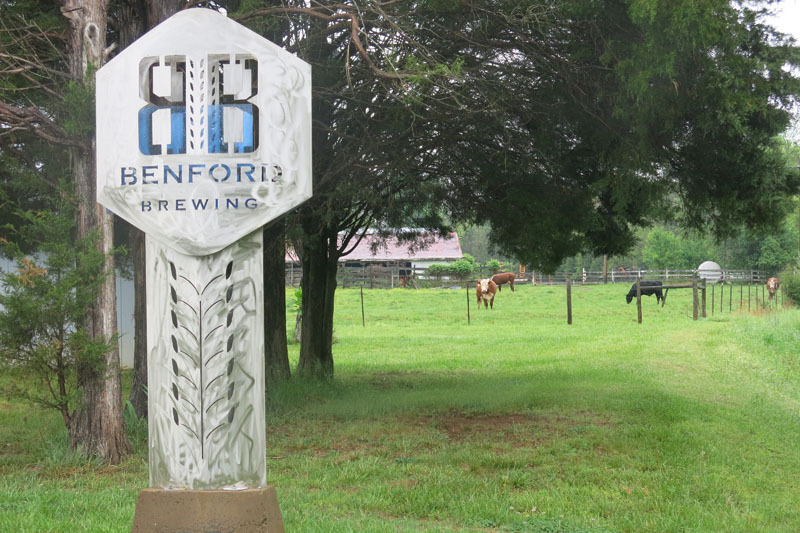 He hasn’t yet brewed a saison, but Benford is every bit a farmhouse brewery. On most mornings, O’Neal walks out to the brewery to mash in, then heads back to the house to have breakfast with his family before returning to his brew day. And sometimes they’ll follow him back to the brewery, where his 3-year-old son likes to help pack cases of bombers. As someone who built his brewery from the ground up on his own family land, O’Neal is uniquely tied to his brewery. He’s the antithesis of a gypsy brewer, of someone like Jarnit-Bjergsø, who has traveled the world over to brew beer. In fact, O’Neal says he hadn’t really talked at length with a fellow brewer until Jarnit-Bjergsø came to Lancaster. The Problem Solver began with CP+B’s initial concept and subsequent falling out with Evil Twin, but this is only half of the story. The conflict between Evil Twin and CP+B might have stopped those two businesses from working together, but in so doing it sent the gypsy brewer to a town he might never have visited, to meet with a brewer he might otherwise never have met. Daniel Hartis runs CharlotteBeer.com and writes about beer for The Charlotte Observer and The News & Observer of Raleigh, North Carolina. He is also the author of Charlotte Beer: A History of Brewing in the Queen City and Beer Lover’s the Carolinas. Well written and very interesting subject. Pictures were good and representative of subject. Just goes to show you how well the “Problem Solver” solved his own problems easily!